When chef David King surveyed the Bay Area restaurant scene, he was blown away by how many restaurants were serving classed-up versions of mac ’n’ cheese — mac ’n’ cheese with shaved truffles, mac ’n’ cheese with lobster, mac ’n’ cheese with obscure and non-traditional cheeses. In Oakland, there was even an entire restaurant, Homeroom, dedicated to variations on a theme of elbow-pasta-in-creamy-sauce. Last Friday, King opened that restaurant, Hutch Bar and Kitchen (2022 Telegraph Ave.), with a menu heavy on Southern staples: raw oysters, American whiskey, and — yes — several different dishes where grits play the starring role. King, whose most recent gig was as the opening chef at San Francisco’s Southpaw BBQ, buys stone-ground grits from Delta Grind, a Mississippi-based company. He said he likes his grits creamy and thick (thicker than, say, risotto) and very, very cheesy. His menu features shrimp and grits — probably the most well-known grits dish outside of the South — as well as a grits dish that features fried catfish (a traditional Memphis pairing) and another that pairs grits with slow-cooked veal shank and a rich sherry-herb gravy. For a bar snack, he stuffs some of the grits with Benton’s country ham and fries them up as croquettes — something along the lines of Italian arancini. The restaurant’s raw bar component pays tribute to beachside spots you’ll find all along the Gulf Coast — the kinds of places in Alabama or on the Florida panhandle where, as a kid, King ate his first oysters during road trips with his grandfather Hutch, the restaurant’s namesake. “[The oysters] had this viscous, gross allure,” King recalled. 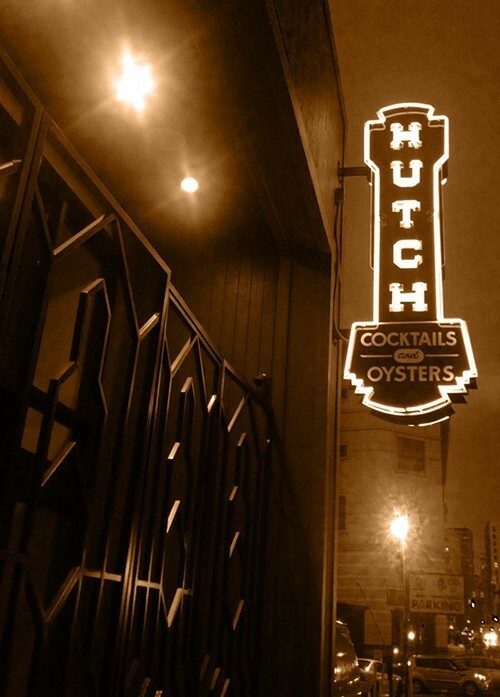 “It’s the kind of thing where you either like them or you don’t, and I guess I liked them right away.” Hutch’s offerings will include one or two varieties of oysters, such as Miyagis and Kumamotos, each night. Other notable menu items include bourbon-cured salmon, crawfish rémoulade, fried green tomatoes, and about sixty different kinds of whiskey. Instead of serving gumbo, which you can get at any number of restaurants, King decided to highlight rabbit Brunswick stew, a lesser-known — but equally homey — regional specialty featuring braised rabbit meat and a stew thickened not by a roux but by the natural starches from an assortment of vegetables. For now, Hutch is open for dinner Tuesday through Saturday, from 5 to 10 p.m. Every Sunday, from 5-9 p.m., there will be a prix-fixe menu, served family-style. The first of these Sunday Suppers, which took place this past weekend, featured fried chicken, green beans, rice, gravy, and biscuits. King said he wants to keep these family-style dinners affordable — about $20 per person. Eventually, he’ll add a short, ever-changing Sunday brunch menu, written on butcher paper each week.